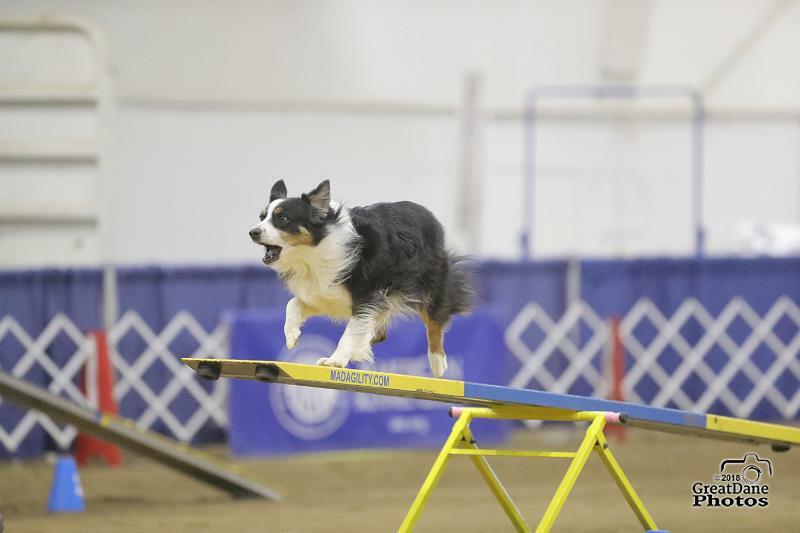 We just got back from the AKC National Agility Championship (NAC) in Reno. This is always a very well-organized and fine tuned event, and this year was no exception. The weather made getting there a bit difficult to plan, as it threatened an "atmospheric river" of snowstorms on the days immediately prior to the event. We left early and arrived without incident. The first day consisted of a "B" match-type warmup run in which toys/training were allowed, but you had to keep the toy in your hand. That negated a lot of the rewarding we like to do (toss toy back, toss toy laterally), but the dogs enjoyed the experience. The next run was Premier Standard; Boca had a great run but dropped the last bar as she flew down the line into the wall of the small arena in Ring 4. Cadence was clean but a bit over-managed by her handler! The real event started on Saturday with Standard and JWW. Boca ran clean in both (although she almost gave Dave a heart attack when she took a couple steps towards the off course tunnel in JWW); Cadence ran sluggishly and incurred several faults in Standard, perhaps due to being out much too early before her run. I brought her ringside just moments before her JWW run and that one went much better. She's 8 and I'm still figuring her out! Sunday morning was Rd 3 Hybrid -- both dogs were clean! Boca's cumulative scores put her in 10th place (out of over 230 20" dogs) going into the Finals. In her Finals run she dropped a bar, but had a great run with really tight lines and finished in 11th. Photos below by Great Dane Photos and videos from 4 Legged Flix. Boca's recap video of all 5 NAC runs (including Premier Standard). Action photos by Great Dane Photos; competition videos by 4 Legged Flix. 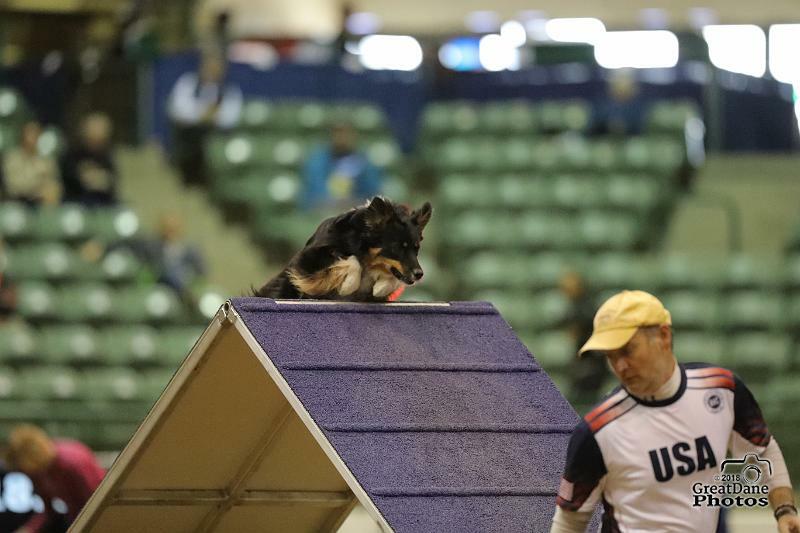 Cadence's Rd 3 Hybrid run at the 2018 AKC National Agility Championship (NAC). Note that a dog in the adjacent ring runs to the gate to bark at her and neither of us noticed much during our run! Thanks to 4Legged Flix for the video!